This morning at The Standard, vto* questioned how anyone can figure that the TVNZ7 ad featuring Bill English could be political advertising, since it doesn’t contain any baldly partisan political statements. What is party political about it? Nobody has come with anything specific to support the contention – merely, “it looks political” “I know political when I see it” etc etc. Specifics folks, specifics. This is a form which has been finely tuned and crafted over half a century to serve a very specific set of purposes — it’s a complex and very challenging medium where every frame, every word, every note is loaded up with as much subtle meaning as possible. With apologies to Tolkien, one does not just walk into political advertising. A few basics of political discourse, first. While in the case of video, a text is made up of sounds and images, this is different from the ‘words’ and ‘pictures’ vto talks about. There is also a temporal dimension to video: editing, mise-en-scene and lighting changes, camera and focal movement, etc. which I’ll lump in with ‘image’ for these purposes. Likewise, most of the sound is spoken words, but there is also music, which is non-trivial in terms of meaning. The point is that nothing is in there by accident. When you have a limited budget and the requirement to work within a 45 second ad slot, nothing is optional or discretionary. Given that there are images and sounds, and that they’re all there for a reason, it should be clear that there’s more to analyse than just the words and pictures, and so an apparent absence of political meaning in the words and pictures doesn’t mean the text lacks political meaning; it just means that it’s not overt (or not overt to everyone). The meaning lurks in how the various parts of the text hang together as much as in the ‘words’ and ‘pictures’ themselves. This, also, is purposeful: people are natively suspicious of political messages, and it helps to be able to communicate them via means which people aren’t accustomed to analysing closely. People are very well accustomed to interpreting political speech (‘words’), but much less accustomed to parsing video texts and the subtexts which emerge when multiple texts are intercut with each other in a dense and coordinated fashion. This is what makes video such a strong medium for political communication; why Eisenstein and Riefenstahl and Capra were given such prominent positions in their respective regimes, and why practically every US presidential election since 1960 has been predicted by which candidate’s TV coverage was the stronger. The clip in question presents a dual narrative which appeals simultaneously to peoples’ cautious, empirical, rational side and to their hopeful, nationalistic, emotional side in order to produce a sense of hope. It is composed of two separate video texts intercut: one featuring footage of Bill English, Minister of Finance and Deputy Prime Minister; and the second of Bill English, kiwi bloke. The topic is the same, and the visual edit minimises the visual difference between the two narratives, while the voice remains constant throughout. This continuity of voice leads us to interpret the statements of Serious Bill and Chipper Bill as if they are uttered by the same person (which they are) and in the same role and context (which they certainly are not). The context is provided by the image, not the sound, and demonstrates that one person can (and should) hold both opinions simultaneously although the relationship between the two narratives is arguable. Of course, people can hold both views simultaneously (though whether they should is another matter). The first, Serious Bill, establishes the Minister of Finance at a respectful social distance in a dark suit (with cut-ins to tie and face); the Sky Tower and the bright lights of NZ’s commercial capital in the background, a composition chosen to provide authority and credibility. This is a fairly soft form of the tycoon shot, a wealthy man overlooking his glistening domain. 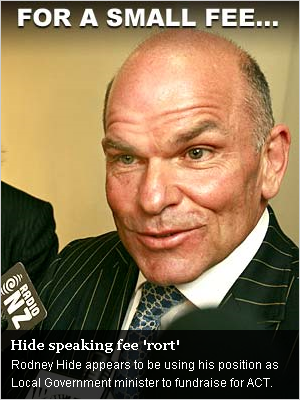 He speaks calmly and in technical terms, playing NZ’s economic problems with a straight bat. He uses the first person plural (“we”) throughout in order to include the audience in his statements. He looks the camera (audience) square in the face, talking directly to us. The second, Chipper Bill, is established in a full-frame headshot, cut from a full-frame headshot of Serious Bill. This is what I mean by ‘minimising the visual distance’ between the Two Bills. He starts with “Y’know”, a commonplace employed more often to tell people what they (should) know than to genuinely appeal to shared common knowledge. This also marks a distinction between the complex, technical language used by Serious Bill and the colloquial, understandable terms and sentiments which follow. It is a relief to hear someone speaking ‘plain english’ after all that techno-jargon, right? Especially when he’s saying something we want to hear: good news about how “we can beat those Aussies”, after the bad news which Serious Bill was talking about, how our we’ve been “underperforming” when compared to them. Chipper Bill — smiling and personable, an approachable everyman in a patriotically black polo shirt, continues to be intercut speaking in exhortative platitudes about how we just need to “back ourselves” (cut briefly to Chipper Bill gazing into the middle distance) and “apply some old-fashioned Kiwi can-do”, and so on, in response to Serious Bill’s authoritative but somewhat dry and gloomy facts. This use of “old-fashioned” is a hint of a dig at the previous government, the one responsible for “underperforming”; this dig is made a bit more explicit with the enthusiastic “we’re nearly through the tough times and things are looking up” — just leave it to good old National and everything will be well, not like that other lot, who were opposed to everything traditional, right? This ad was not about policy. Its sole purpose was to begin creating a set of positive associations to him and narrative about the Man from Hope — framed, from start to finish, in terms of hope and the American Dream. […] The ad created in viewers a vivid, multisensory network of associations — associations not only to the word hope but to the image of Hope in small-town America in an era gone by. This “Two Bills” ad creates a similar hope narrative around the putative Kiwi Dream of “beating the Aussies” with “good old Kiwi can-do”. How could anyone not like that? Just so you’re not starved of policy analysis, there are unstated, non-trivial National party assumptions about what’s important all through the ad too. The prime one among these is a focus on financial metrics (GDP growth, productivity growth) to the exclusion of other considerations. A Labour ad along these lines might have emphasised a balance between economic and environmental and other outcomes such as quality of life — the fact that this ad mentions no other metrics than wealth is not value-neutral or void of political meaning: it demonstrates the writer’s policy priorities and direction. As well as that, the “beating the Aussies” narrative is a core plank of the government’s current policy of “closing the gap” — it’s not policy-neutral either, but is a function of the government’s own preferences and their political strategy of measuring themselves against previous governments on metrics which favour them. And hang on a minute: are we really “through the tough times”, and are things really “looking up”? Depends who you ask; this is a matter of opinion and legitimate professional dispute among Those Who Know About Such Things, it’s not a slam-dunk even if the Finance Minister says so: after all, it’s his job to say so. And will “old-fashioned Kiwi can-do” on its own really be sufficient to bridge the significant productivity and GDP growth gaps between NZ and Australia? What the hell is “old-fashioned Kiwi can-do” anyhow, and if it were that easy, why haven’t we done it all before? The entire narrative is constructed of politically-charged assumptions, but it is formed in such a way as to discourage the audience from thinking too hard about it. There’s one other thing, too: Plain English is Bill’s newsletter to his constituents, and it looks like the similarities don’t end there. It was a catch-cry of his 2002 election campaign. Perhaps if he’d had this production team working on that campaign he’d have won, or at least done well enough to prevent Don Brash from taking over. So that’s a reasonably thorough teasing out of the political content of this seemingly-innocuous 45-second commercial. As I said in the comment thread at The Standard, the only thing more absurd than this ad getting made and screened with a straight face is Eric Kearley employing the Lebowski Defence when challenged on the fact that the ad quacks very much like a propaganda duck. Regardless of whether it was bought and paid for, as the more conspiratorial commentators think, or whether the use of the form was simply a (very successful) ploy to garner attention, it’s idiotic to pretend that this isn’t political advertising in function. While I tend to find industrial explanations for apparent media bias more compelling than political explanations, people like Kearley obstinately denying the bleeding obvious doesn’t make it especially easy to keep doing so. * Stands for ‘Vote Them Out’, as I recall. *** It helped that Bill Clinton was from the town of Hope, Arkansas. Blog Link: Disloyal Opposition in the US. For some time I have watched the opposition to Barack Obama and his administration with growing unease. Having some familiarity with Latin American politics, I began to see parallels between the traditional behavior of conservative Latin American oppositions to Left-leaning democratic governments and that now manifesting itself in the US. I have now pulled my thoughts together into this month’s Word from Afar essay over at Scoop. The essay has more of a polemical tone than usual, but that is a reflection of my contempt for, and concern over, such behaviour. DPF published two posts yesterday about prominent lefties comparing righties to fascists: Minto comparing Bush to Hitler and Amin, and Carter comparing Key to Mussolini. I agree with him that both comparisons are entirely unjustified, and do a great disservice to political discourse in this country. 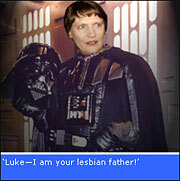 But without taking away from that, let’s not forget that David, his commentariat, his blogging cohort and indeed some of his ideological allies have spent most of the past decade making political hay by comparing Helen Clark to various dictators. David was central to the Free Speech Coalition whose billboards protesting the Electoral Finance Act evoked Mao Zedong and Frank Bainimarama; he wrote a weekly column entitled ‘Dispatch from Helengrad’, perpetuating the Clark=Stalin syllogism; his blog permits and tacitly endorses the almost daily comparison of left-wing political figures to tyrants; his closest blogging acquaintance Cameron Slater has constructed his political profile almost entirely of such cloth. The National and ACT parties themselves have a very large portfolio of such comparisons — from the Young Nats publishing the famous image above, to Heather Roy talking about the Clark government’s ‘feminazi’ welfare agenda to Bill English’s frequent comparisons of the Clark government to the Mugabe regime in Zimbabwe, both in the House and in the media. And how could I forget John Banks — former National party cabinet minister and now Citizens & Ratepayers Mayor of Auckland — whose public comparisons of Clark to Hitler, Stalin, Mao and Pol Pot and references to her as the ‘Chairman of the Central Committee’ among others only ceased when he decided to run for Mayor and they were no longer politically tenable. To say nothing of the foaming of various branches of the libertarian and objectivist movements, who are admittedly further from National than Labour are, but nevertheless have been occasional allies of convenience. Although typically less egregious than Carter’s and Minto’s comparisons, these are all the same in principle. The difference is one of magnitude, not of type. And the very worst examples of the type are exclusively from the right. I should imagine that many of those who engaged in these sorts of attacks on Clark and her government but who are wide-eyed with mock outrage now that the shoe is on the other foot believe (to themselves if not in public) that the former comparisons were rooted in reality, while these latter are not and so are not justified. This demonstrates a phenomenal absence of political or historical perspective: Clark, like Bush, was removed peacefully from office by the ordinary process of democratic action, and the comparison of their programmes with those of the named dictators simply does not bear comparison, and it is disrespectful to history to draw it. David is right to point out that Labour are wrong for stooping to the level of National and ACT and their less-savoury constituents, but that does not erase the initial wrongness which spawned it, and in which he played a role. Are HR managers selected because they are bullying sociopaths? I have often wondered what sort of person becomes a human resources manager or corporate employment lawyer in New Zealand. Now, with the cases of Sean Plunkett and Jim Salinger in front of the ERA, coming on the heels of my own experiences, my beliefs are being confirmed. This is what I believe. NZ HR managers are hired for their sociopathic and bullying tendencies. They are devoid of compassion, understanding and basic human decency. They take delight in the flaws and failures of others, and many are pathological liars (witness NIWA HR accusations against Dr. Salinger that he was “sparse with the truth” (i.e.a liar), or, in my case, my employer’s HR toadies attempting to fabricate a case of prior warnings and incidents (there were none relevant to the case in question) and then accusing me of falsifying leave forms (which was not only irrelevant but which other administrator’s contradicted). In the Radio NZ case Plunket had no contractual restrictions on his writing a column elsewhere yet he was threatened with dismissal for doing so. It appears that a personality clash with his boss (which is what was really at the heart of my case) is the real issue, with the boss attempting to control Plunkett’s behaviour outside of his contractual obligations. Dr. Salinger and myself received no formal warnings prior to our respective (in my case legally unjustified and in his case surely unjustified) dismissals. In both of the latter cases, relatively minor breaches of protocol got us summarily dismissed without warning or attempts at compromise or conciliation. Basic notions of fairness would indicate that in all these cases the employer acted in bad faith and then vilified the employee to cover up their own lack of ethics and adherence to procedure. Basic understanding of democracy would reveal why this is not only unacceptable as a social practice, but in fact inimical to the democratic form. After all, New Zealand is supposedly a robust democracy, so its labour relations framework should be quite different from that of China, Singapore, Iran or Saudi Arabia. Alas, on the essentials, it is not. In general, HR types and their hired employment lawyer guns basically use the strategy of character assassination and deep pocket spending to outlast and break down the employee (and, in some cases, his/her union). When settlements are reached, they often reflect employee financial constraints or psychological trauma regardless of the positive merits of their case (and in which, in the case of both NIWA and Radio NZ as well as mine, the legal fees and/or the (eventual) settlement offer of the employer were/will be paid by taxpayers). In fact, I wonder when do defamation cases apply in employment disputes? How can HR managers knowingly and deliberately make blatantly false accusations of employee dishonesty and malfeasance in open hearings that are reported on by the press, and yet escape legal action against them for defamation or slander? In my case all of the accusations against me were proven false, and yet the stain on my reputation has remained ever since (and prevented my securing alternative employment in my profession). Although I have no doubts that Dr. Salinger and Mr. Plunkett will win their cases or receive settlements, I wonder if Dr. Salinger will be able to secure employment in his chosen field with another government agency or private firm in NZ ? (Mr. Plunkett has the advantage that he has not been fired so does not have to look for work). Where is the justice when an employee wins a case but is not allowed back into their field of work (and in my case forced to leave NZ), and/or where his/her character has been impugned in the pubic consciousness? In any event, I have noted in the past that there is a sort of mean-spirited aspect to the NZ character, something that emerges in politics, the corporate world and in education (among other fields). I am now coming to the belief that not only do HR managers (and employment lawyers working for firms) epitomize these nasty traits, but in fact are hired precisely because of them. The reason? Given the structure of employment law in NZ, these traits serve a useful purpose for employers regardless of the costs inflicted on employees and those that chose to represent them. PS: To be clear. I am not referring here to small business employers, who do not have the money to hire HR teams or corporate lawyers to do their dirty work (or at least dismiss their useless workers). The lack of litigation money and legal funds makes small business owners more vulnerable to adverse ERA or Employment Court decisions,and therefore more cautious when approaching dismissals. The large corporates (state or private) have no such concerns, given that employment law favours the structurally powerful rather than fairness under the law. The story of Rodney Hide’s ministerial fundraiser is making headway — at present, it’s the splash spot on stuff.co.nz and is pretty prominent on the Herald site as well. This image is strong. Close-ups are rarely flattering, and this one has an unctuous, indignant defensiveness which evokes, well, just about every crooked politico in history. The text, leading with the universal refrain of officials on the take and following up hard with that beloved word ‘rort’, gives the audience all the necessary context. This is a position Hide has spent his political career avoiding, and one which he was once merciless in prosecuting. It’s a long way to fall. It seems that the credit for this should go to Eddie, who drew together its various strands into the narrative we now have. It’s been picked up by a few blogs, including Red Alert, where Phil Twyford published his own clearly-derivative-but-not-attributed riff on the topic earlier today, complete with Goff’s press release which forms the basis for the NZPA story. And it looks like Eddie even chose the photo which Stuff ran with — only one is flipped on the vertical. Well done. Update: Lyndon in the comments points out that the threads were in fact drawn together by North Shore mayor Andrew Williams in the first instance, and published on Scoop.co.nz – so Frist P0st credits there, although the Labour response seems more derivative of Eddie’s work than that, so my point largely remains. The False Promise of Asian Values. The country that I live in is a major exponent of the so-called “Asian Values” school. This school of thought argues that Western notions of liberal democracy are not applicable to Asia because Asian values are different than those of the Anglo-Saxon world and therefore attempts to impose Western-stye democracy are ill-suited to local conditions and, what is worse, a form of cultural imperialism. So what do Asians value? According to the official line, they value the primacy of collective rights over those of the individual, order above freedom, material security over political voice, and economic efficiency over egalitarianism. The private sphere is reified while the public sphere is circumscribed. Family and community take precedence over the individual or narrow social group interests. These are held to derive from traditional “Confucian” values. Hence civil society is not a spontaneous expression of variegated social interests but a state-structured (and state-supportive) amalgam of overlapped sectorial agents in which “volunteerism” is imposed as a social obligation rather than freely given. Conformity is enforced as the means by which to achieve upward mobility, and although meritocracy is given rhetorical championing by the state, in practice it is often subordinated to the requirements of playing along, following orders and not challenging the status quo as given. Needless to say, this reverses most of the priorities of Western liberalism. Asian values exponents will argue that the proof of the superiority of their system is in the pudding: individually and collectively Asia is a region of rising economic powers, with their growth only checked by foolhardy attempts to impose western-style democracy on immature populations not yet ready to accept the fact that with expanded political rights come an equal amount of social and political responsibilities. They point out the “chaos” of democratic society in the West and where democracy has been attempted in Asia, as opposed to the order found in the “traditional” East. They see social hierarchies as natural and exploitation as inevitable, with attempts to ameliorate this “natural” order of things contributing to social unrest and instability. The latter are considered to be primordial dangers to “good” society, and to be avoided or suppressed at all costs. What I find interesting about these claims is that they mirror claims made about Latin American societies in the 1950s through the 1980s–that they operated under a different (Catholic) social code that was authoritarian, patriarchal, racially and economically stratified, state-centric, community- and family-oriented, and was therefore more naturally amenable to authoritarian forms of rule. And yet Latin America has by and large democratised with no ill-effect other than to give space to populist demagogues along with sincere politicians (as happens virtually anywhere political competition is opened up to mass appeal). But in terms of social stability, economic growth, etc., Latin America has not been discernibly hurt (or improved) by the move towards social and political freedom. It has simply evolved in a more open direction. So what to make of the Asian values argument? Well, living in the epicenter of its practical implementation it would appear that “Asian Values” are no more and no less than the philosophical justification for developmental authoritarianism. These values are no more natural in the East than they are anywhere else–all societies put value on family, kinship, order, efficiency and stability. It is in the imposed and contrived ways in which “Asian Values” are reproduced–from the top-down, through the State and its agents, rather than spontaneously welling up from the cultural grassroots of society at large–that we see its real purpose. The Asian values argument is in reality just a cover for the maintenance of an authoritarian status quo that otherwise would be susceptible to challenge from those that it purports to represent. Public consultation meetings about the 2009 Defense Review, which will result in a White Paper being published in early 2010, have now concluded. Yet, although the formal submission deadline for individuals and groups has passed, the review committee would be ill-advised to ignore short-term late submissions when they have another 4-5 months to go before the final draft of the White Paper is published. Late does not always mean never. You can access the terms of reference and information about submissions here. It is important that those of the Left of the political spectrum and progressives in general get involved in defence and security issues on an on-going basis, and for them to avoid knee-jerk abhorrence or avoidance of national security issues except when it is topical or effects them directly (such as in the Zaoui case or that of the Urewera 17). Ignoring defense and security issues leaves the field of play open to security conservatives and the Right in general, including pro-nuclear and abjectly pro-US elements within the political spectrum. Allowing their views and those of the defense and security bureaucracy to go unchallenged is to concede to them the terms of debate and skews the tone of the White Paper in a conservative-Right direction. That is not healthy for a mature democracy. In order to do so, however, the Left needs to have something smart to say and not simply repeat the usual pacifist/anti-imperialist mantras. Having the Green Party lead the Left on defense is a non-starter (however well-intentioned the Greens may be) because of their adherence to the pacifist/anti-imperialist line, and the Labour Party is equally unrepresentative of the range of Left thought on defense issues. That leaves a void where the informed Left should be: New Zealand may be small and physically isolated, but it has real security needs and obligations to the international community that require its involvement in foreign military adventures, be they multilateral or bilateral in nature. Simple distaste for the military and police does not cut it when addressing the fundamentals of national security in a small state such as this. What is needed is a Left-progressive critique and plan for near-term security requirements, something that can involve a number of alternative prescriptions based upon notions on humanitarian assistance, non-intervention, multilateralism, peace-keeping and nation-building, non-traditional security concerns (such as environmental degradation and pandemics) and/or non-proliferation (nuclear and conventional). The Left can (indeed, must) offer recommendations about how and when NZDF personnel are deployed abroad, under what chain of command, and for what purposes (something that at the moment is left to the government of the day). All of this requires some degree of understanding of national security and defense requirements, including strategic and technical issues. I would love to get involved in this process but I live abroad and have not been asked. Instead, security conservatives in my former department and other NZ universities have a lock on academic submissions to the Review regardless of their actual “expertise” on such matters. Thus as it stands the Review process is stacked to the Right, and the White Paper will reflect that. For no other reason, this is why the Left needs to get involved in the Review process, because it will be too late once the White Paper is published (and it should be noted that the Review Committee is comprised of former military and/or defense officials). I have very strong views on how the NZDF should look and how it should be deployed abroad given its international role and reputation. This includes views about the defense budget (both as a percentage of GDP as well as in terms of relative outlays to weapons acquisitions and personnel), force configuration and strategic orientation. But since I cannot weigh in on the subject, I hope that others will. I therefore urge you and your like-minded acquaintences to make your informed views known ASAP, as the deadline for submissions has passed but the Review Committees deliberations have not. Should the committee refuse your submission, enlist an MP or publicly agitate for its inclusion and consideration. Being late does not mean you should not be heard. Obama’s prize: why not refuse it? I was as surprised as anyone else who’s been paying the smallest bit of attention to geopolitics this past year when Barack Obama was announced as the 2009 Nobel Peace Prize laureate. This is one issue on which many of his supporters and critics are apparently united: what has he done to deserve it? So why accept it (essentially on credit) instead of refusing it, requesting that the Nobel Committee award it to someone else, and accept a future prize at a later date when the award can be made on the basis of merit? This course of action would demonstrate that Obama is more concerned with world peace, with the (admittedly flagging) credibility of the Nobel prizes, and more importantly with action than with pretty rhetoric and his own status as a diplomatic celebrity. Rejecting this award would have caused a stir and some embarrassment among the international diplomatic community, but it would have been an opportunity to silence critics on both Obama’s flanks, the pacifist left and the right. Certainly, some would have found ways to turn it against him (after all, the sun still rises in the East), but I believe it would have been met with near-universal acclaim. It would have been a clear message: judge me on my achievements, not on my identity. This was a test, and to my mind Obama has failed. It’s a damned shame. As you may have noticed, posts have been somewhat infrequent over the past month or so. We all have busy lives, and other responsibilities are preventing us from maintaining our customary blogging pace. So, here’s an opportunity for you to hold forth on a topic of your choosing in a guest post. What’s eating you? Something you’ve been aching to talk about, but haven’t done so for fear of running off-topic; or a critique or comment which didn’t seem appropriate; or a matter of burning importance which hasn’t received adequate treatment. Send us an abstract (in comments or by email to lew@kiwipolitico.com), and if we like your pitch we’ll give you a chance to post it — under your own name, a pseudonym or anonymously. As usual, the standard of a post’s content and reasoning is what matters, not its ideological alignment; although it would be advisable to read the comments policy before beginning.